Over the weekend, China's statistics bureau announced a significant dip in the country's birth rate with the number of babies born in China last year falling by 2 million to the lowest annual rate since the country was founded in 1949, despite Beijing's recent attempts to encourage couples to have more children. In 2016, China partially ended its one-child policy to allow couples to have two children, but as we warned repeatedly since then, the policy has done done little to spur population growth as rising living costs weigh on couples considering a child. The birth rate in 2018 dropped to 10.94 per thousand, down from 12.43 the previous year. The number of babies born in 2018 dropped by 2 million compared to the previous year to 15.23 million. The birth rate is the lowest since 1949. China's population is nearly 1.4 billion. Commenting on China's demographic collapse, Wang Feng, a sociology professor at the University of California, Irving, said: "Decades of social and economic transformations have prepared an entirely new generation in China, for whom marriage and childbearing no longer have the importance they once did for their parents' generation." Cited by DW, Beijing officer worker Mina Cai said: "Many of us grew up as only children and we're a little selfish about putting our own satisfaction above having kids." Independent Chinese demographer He Yahu echoed these concerns when he said: "The low birth rate has led to a seriously ageing population. On one hand, families are getting smaller, reducing support for the elderly; on the other hand, the elderly population to workforce is growing, which increases the burden on the working population." As we reported at the time, China surprised the world three years ago when it announced the end of its one-child policy, which limited many families from having more than one child. The policy was criticized for giving rise to forced abortions and sterilizations, for encouraging couples to try to have boys rather than girls and for catalyzing China's sharp decline in births. China's new civil code is set to be unveiled in 2020, with all mentions of "family planning" removed from the text, according to media reports. Observers suggest it could mean Beijing will be lifting limitations on family sizes introduced in 1979 to control population growth. Besides demographics, China's transformation into the next Japan has major, and potentially dire, consequences for the local economy. 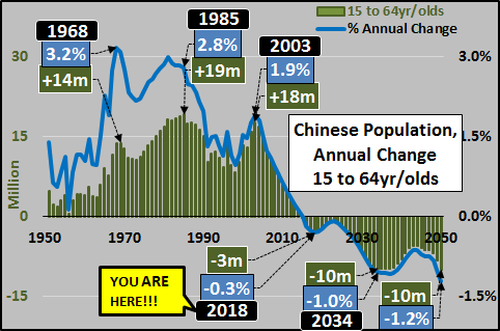 As we reported back in October via Econimica, the 0-to-24 year old Chinese population swelled by over 300 million from 1950 to it's ultimate peak in 1991. 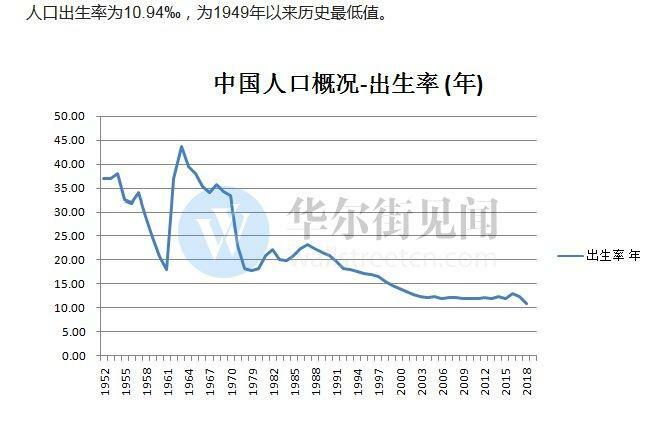 Since that peak, the total population of young in China has fallen by 176 million, or a 30% decline in the number of children across China. Moving forward, the UN has expressed hopes the formal elimination of the one child policy would simply slow the rate of decline in the population...but by no means will China's fast declining childbearing population (those aged 15-44) nor disproportionately young male population potentially be offset by a slightly less negative birth rate. Contrast that with the quantity of debt being forcibly injected into a nation that faces a massive imminent population decline. 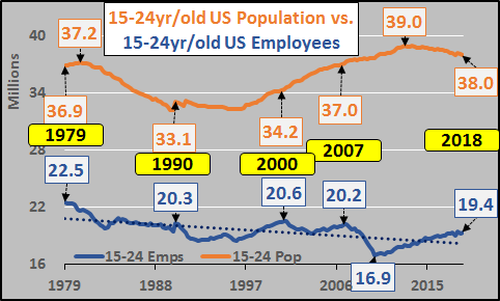 And the coming decade only worsens as the young population continues its unabated fall and debt creation (absent concomitant economic growth) continues soaring... building more capacity all for a population that is set to collapse. 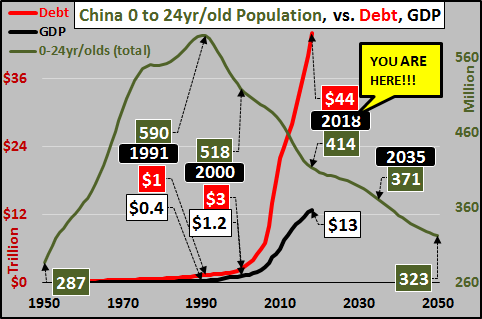 Simply said, without a dramatic rebound in China's birth rate, massive overcapacity (thanks to over a decade of government mandated malinvestment) versus an ever swifter declining base of consumption does not add up to a burgeoning middle class or a happy ending. 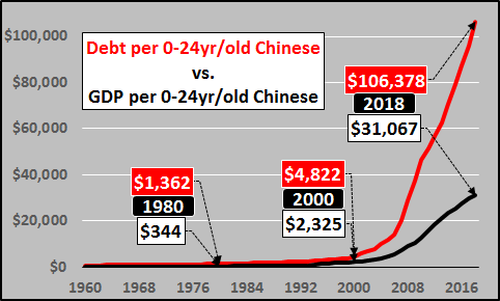 ... confirming that the next generation, whether in China or the US, is set for a painful collision course with debt bubble dynamics.